2. What are the border proceedings like? What documents should I expect to be given, stamped etc....as I know they like to issue fines on such buearocratic matters. 3. Can I get Meticas somewhere in Manguzi or should that be done at the border? I have a house in Ponta, so maybe Im a bit biased. I would go thru Kosi gate and head to Katemba for the ferry. The road is not bad and you are on the trip for an adventure. Distance is about 100km and will take u about 3 hours. The ferry is also an experience. Stop off at the fish market and have a meal in the restuarant behind the market. A real african experience! Xai xai is not that far to go. I would also spend a day in ponta. I will post more info tomorrow. How does the ferry work? does it have a schedule? Hopefully doing offroad to Vilanculos in Dec.. so Sub !! Make sure your vehicle is 100% road worthy, the slightest issue will cause you countless fines/bribes. Ensure you have two high visibility vests in your car. Do not drive with any part of your body outside the vehicle. All people in the car to wear seat belts. If towing, have a triangle on the front of the card and behind the trailer (on the right) and a ZAR sticker on the back. No open alcohol in the vehicle (not even the passengers). Driver to have passport and drivers license on hand. Some say you must present copies, but they seldom accept this and you need balls to stick to your guns. Stick to the speed limits. One km over the limit will result in a fine. From what I can recall, 1 km/h over the limit = 1000 mets (about R330) fine .. 11 km over = R2000 fine and so on. 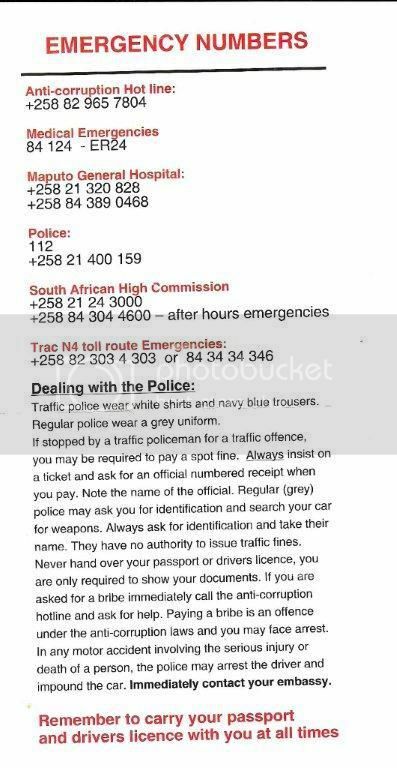 The officer will want a bribe ... they are trying to stamp this out by issuing the pamphlet below, but in reality, it is very difficult to follow this advice. This advice applies to the Kosi bay crossing only! The border crossing is laid back and generally a breeze! The border is approximately 630kms from Jo’burg and 460kms from Durban and is open 7 days a week (08h00 to 17h00). Best you arrive at the border at least 15 before 17h00 to ensure your crossing. Between the border and Maputo/Ponta a 4x4 vehicle (or 4x2 bakkie) is required due to the soft sandy roads. Should you not have one; a border transfer to Ponta can be arranged. For the brave, you can catch a taxi to Maputo. Taxis wait about 100 inside Mozambique. Your vehicle can be left at the parking lot just before the border (on the left) at a charge of R30.00 per day. The parking lot is privately run and secure. You can not exchange Rands at the Kosi border, but Rands are welcomed in Ponta (exchange approx 3.3 Mets to R1). Rands are generally accepted further north, but exchange rate is 3 Mets = R1. From Maputo and north, You can pay for fuel using your Visa card. Between the border and Maputo, fuel is available at Ponta and Bela Vista. 3rd party insurance cost R150.00 for your vehicle. Trailer will cost an additional R80. You will be required to present both documents if stopped. South African Passport holders DO NOT require visas. Other nationalities can purchase a visa at the border (last check it was +- R180), but it is better to arrange prior to departure. From the border, keep left and follow the main road This is a bit of a joke as their are many branches in the road, but stick to the most used road (while keeping left). The first 30 km is the worst, with deep sand in some sections. The road improves from Salamanga. There is a permanent road block here. You need to produce drivers license and vehicle papers. This road block is an attempt to stop the hijackings in SA (as this is only one bridge over the Maputo river going north). Katemba is the southern access point for the ferry. Proceed to the market and park in the car que near the filling station. Buy a ticket at the office next to the filling station (ask anyone, they will direct you to the office). I forget the cost, but it is reasonable. The ferry operates between 7am to 6pm and is an experience. Depending on the time, stop at the Katemba hotel (+- 5km before Katemba market) and enjoy a 2M on the veranda over looking the bay. On disembarking you have 2 choices, head north on the EN1 or take in the sites and smells of Maputo. To experience the esplanade, keep right and follow the road north with bay immediately on the right. The fish market in just off the road, next to a Petromoc on the left. If the market restaurant is not your thing, proceed bit further north and stop for a meal at the iconic Costa do Sol (09258-1450115) which is right next to the road. EN1 up north is as good as you get. we traveled at night in Aug'13 and I would say that it is as safe as travelling in SA. Having said that, we only went as far as Vilanculos. The visa is a bit more tho,last time my wife paid R540,not sure if prices differ from countries. Also its important to keep certified copies of all sa documents....just to be on the safe side. Yamaha TZR250 - ride it like you stole it! When driving in traffic - "expect the unexpected". Generally 90% of drivers are OK but the 10% are out of control. Stick to speed limits no matter what the locals are doing. If you are stopped stay polite and try to understand exactly what they have stopped you for. Often they are taking a chance on getting a coke or money for a coke. If you drive at night be very aware that you may (will) meet vehicles with no lights. Ok...one more question...do I need an international driving permit (the one from the AA) to drive in Moz? Or can I just take my SA one? Just keep an eye on the news. Been hearing that Renamo is causing trouble up north in Moz - Beira - Sofala, this province is north of Inhambane. 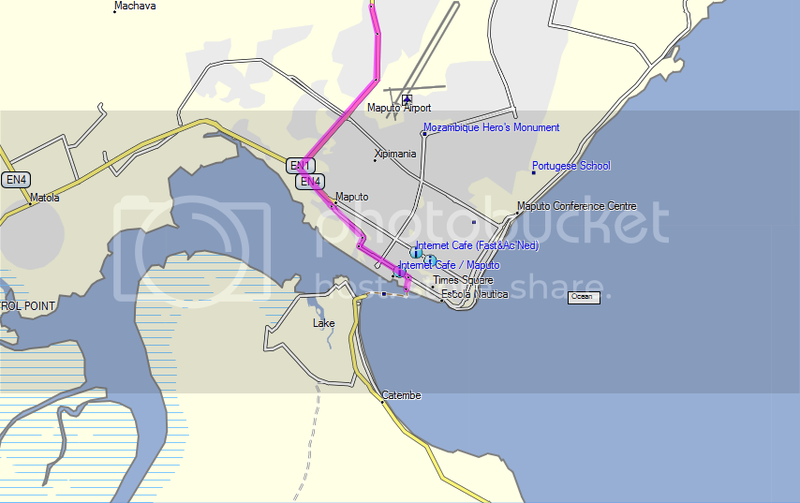 I am planning doing the Kozi bay to punto for a day drip on my bike, anything further that has not been addressed in this post that we should be careful of? I rode through from Beira, don't go over the speed limit at any time when in towns, maximum fine they can give you was at that time 1000 mitre. Have fun! May catch you on the way down again from Zanzibar. OK....so just got back from Moz yesteday and thought I would give feedback. All in a cool experience, but I have to admit that I wouldn't drive up without being in a convoy again...very stressful and frustrating to do it solo the first time. One factor here is the lack of signs indicating that the speed limit is raised after a town....sort of a guessing game, and this is where I found all the speed traps to be located. Used the signs in the opposite direction mostly, but sometimes there is a "100" sign FAR out of town and they apparently like using these zones to trap. I have attached the Road Code of Moz...print it and take it along on the trip. They are obliged to have a copy in their cars (in Portugese) and if they want to fine you they have to quote you the Act number etc....so it helps to argue a point when they take a chance. Note that all fines have been standardised along a sliding scale....our trickster started with a 8000mets fine when it was supposed to be 2000 so be careful. Oh, regarding the Renamo thing...all travel north of the Save River is dodgy. The Dutch embassy has warned its expats in Moz to not travel north and most of the Saffers told us to stay below Vilanculos. There have also been a series of kidnappings for ransom in Maputo, seemingly at random not targeting anybody in particular. HET DAAR BEGIN VISVANG IN 93 NA DIE OORLOG NOG NIKS HET VERANDER AS JULLE STORIES LEES ..ONS IN DAI JARE DIE PROBLEEM UITGESORT MET N KLEUR PRINTERKIE 2 COPIES BACK TO BACK GEPLAK MET SILVER STREPIES EN AL SOMMER LATER OMGERUIL VIR DIE HEEL KAKSTE RATE BY N SLY FOREX SKELM WHO CARES AS EK EERS METIKAS HET MAAK MY MAAG , DORS EN 4X4 VOL HOU TE LEKKER VAKANSIE 50S WERK DIE BESTE ... HOEKOM VOEL DIT NET ONS SUID AKRIKANERS IS SULKE SUCCERS ALMAL KOM VAN ORAL DOEN NET WAT HULLE WIL EK LAT MY NIE MEER RO;''';. '/'K NIE EK MAAK MY EIE PLANNE IN AFRICA!!! !